Actor James Badge Dale plays Capt. Speke, an Army Ranger at the center of a zombie Apocalypse, in "World War Z." 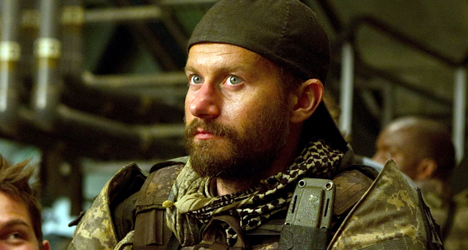 During his 23-year acting career, James Badge Dale (“Shame”) has fought Japanese soldiers (TV’s “The Pacific”), man-eating wolves (“The Grey”), and even savage military school cadets (“Lord of the Flies”). Now, he must go up against hordes of angry zombies in “World War Z.” In the horror/thriller, Dale plays Capt. Speke, an Army Ranger at the center of a zombie Apocalypse. During our interview, Dale, 35, talked about what it was like working on a set filled with actors in zombie gear, his thoughts on the post-production problems that have been reported since last year, and what actually keeps him up at night. 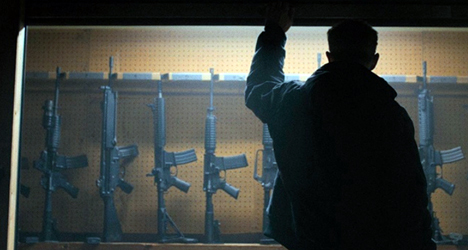 We’ve gotten at least half a dozen Apocalypse-themed movies over the last couple of years. What do you think it is about this type of story that has such staying power? Ever since we could write, we were always writing about the End of Days. We’ve always gravitated towards the question: What would happen in the Apocalypse? It’s part of our culture. The survival story has actually been part of your career since the start. Your first film was 1990’s “Lord of the Flies.” Then you’ve done other projects like “The Pacific” and “The Grey,” which are also stories of survival. Does this theme feel like part of your acting DNA in some ways? (Laughs) I really like stories that go outside the realm of what we deal with in our normal, day-to-day life. I do gravitate to stories with extreme scenarios. How does the survivalist narrative change when what you’re trying to survive against isn’t based on reality? I mean, in “The Pacific” Japanese soldiers are trying to kill you. In “The Grey” you’re dealing with wolves and the natural elements. But here we have zombies. 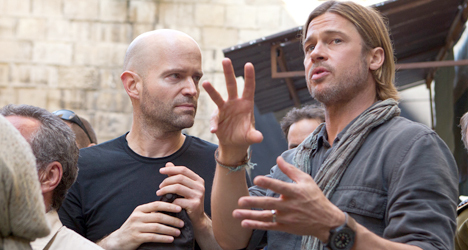 Are these surreal moments something you can leave on the set or were you having nightmares about zombies chasing you? (Laughs) I left this one on the set. I’ve had other jobs where I’ve really taken the character home with me, but this one I tried to leave it. But I’ve seen the film and there are moments in the film that have kept me awake. Another Apocalypse-themed movie that is coming out this week is the comedy “This is the End” where actors like James Franco and Jonah Hill play themselves. How would you react to an end-of-the-world scenario? Let’s say a pack of zombies are at your front door. Would you survive? (Speaking sarcastically) Oh, yeah, piece of cake. I’ve had training. Anything I can do in movies I can do in real life. (Laughs) Nah, I’d be the first to go. Why wait? Why prolong the inevitable? Zombies are at my front door? I’ll be right there. Let me just put on some pants. In this film we’re dealing with a zombie pandemic. We’re always hearing in the news about these new viruses that mutate and can spread across the world and kill everyone. Do reports like that worry you at all or do you think it’s just how the fear-mongering news media works today? I do think there is fear mongering, but rightfully so because it’s frightening. If you want to talk about something that keeps me up at night, there’s a game for your iPad called Plague Inc. Basically, you’re a virus and as a virus you have to figure out a way to spread. I mean some of these viruses mutate and change. Who knows if medicine can keep up with it? It’s happened before in history. These plagues come along and could wipe out half the population. It just shows us how powerless we are to a lot of things. (Laughs) Eh, but I try not to worry about it. I’d rather just play the plague videogame. This really is your first horror-type movie. Were you a fan of the zombie culture before you came into this film? I’ve always been a fan of films like George Romero’s “Night of the Living Dead.” That is a genius movie. Also, I like Danny Boyle’s “28 Days Later.” I like the genre, so to actually get to be in one is a gift. In acting school you don’t take zombie class, so it’s new territory for me. Red flags always go up for entertainment news media when we hear of films experiencing production setbacks. 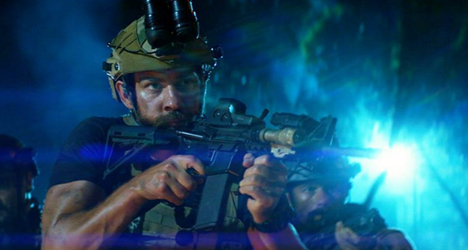 We really start to worry when a film’s release date is pushed back like with this film. As an actor, how do you handle that kind of news? I know a lot of it is out of your control, but I’m sure you want your name attached to the best product possible. 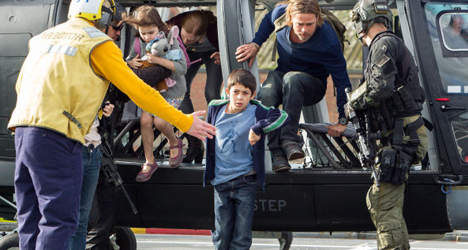 The odd thing is nothing happened on “World War Z” that was out of the ordinary. The only thing that was out of the ordinary was that [producers] were honest about it. I don’t think I’ve ever done a project that hasn’t had reshoots. It happens all the time. It’s just the natural process of things. It’s just hard on the filmmakers. I was talking to a director once and told him my job was easy. I show up for production and then I go home and sleep well at night. The director is up all night for another year or two in a dark room in post-production arguing with producers, money guys, studio heads, executives, lawyers. It’s a massive undertaking. But I think we really have a great film on our hands. I’m really proud of this movie. I’m sure you’re sleeping well, too, because you don’t have zombies on the brain. (Laughs) Yes, I’ve moved on! I’m about five movies past that now. We’re also going to be seeing you later this year in the film “Parkland” where you’ll be portraying Robert Oswald Jr., the brother of Lee Harvey Oswald. Did you have to have empathy for the Oswald family to get what you wanted out of this character? Absolutely. I didn’t know the story about this family. I did know the story of Robert Oswald and Lee Harvey Oswald and growing up with Marguerite Oswald, who is played by Jackie Weaver. I have to say, she is brilliant in this. It was a very complicated family dynamic. I just found it fascinating. You always have to empathize with your character even if the character is someone everyone else will call a terrible human being. You can’t think like that. You can’t judge them like that. You have to find a way into their lives and empathize. Everyone is doing the best they can in this world. I’ll be remiss if I didn’t ask you about what was one of my favorite films last year, “Shame.” I was shocked when I woke up the morning Oscar nominations were announced and didn’t hear Michael Fassbender’s named called for Best Actor. What did you think? I was pretty shocked also. He is just so talented and gifted and he works. He works! He is just so dedicated and I had a great time working with him. I thought he deserved it. Hopefully there’ll be another opportunity in the future for him. I love that movie. I loved working with [director] Steve McQueen and Michael and Carey [Mulligan] and Nicole [Beharie]. It’s one of the best experiences I’ve ever had.